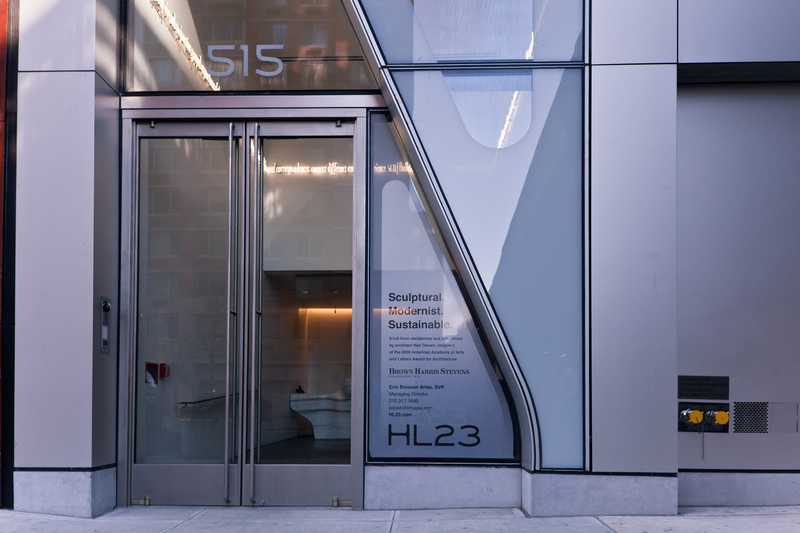 Ellison Bronze, Inc., the inventor of the balanced door and provider of the highest quality marquee entrances in the industry, offers its custom door systems to High Line 23 (HL23) in New York City. The stainless steel doors offer a sleek look that matches the building’s modern feel, while offering decades of longevity. HL23 is the first freestanding design of Neil Denari, principal of Neil M. Denari Architects, Inc. (NMDA). The fourteen story residential tower rises from a unique site on West 23rd street in Manhattan’s West Chelsea area. The building is only 40 by 99 feet at its base, and partially hidden beneath the abandoned High Line elevated railway bed. The site created the challenge of building around the elevated railway bed and finding a way to increase square footage. The result is a reverse-tapering structure that is narrow at the bottom and widens as it rises. The project team bent the curtain wall inward around the railway and pushed out the east façade to regain lost square footage. The project team also wanted an entrance for HL23 that would live up to the modern feel of New York’s newest and most high-profile luxury condos, and that would last far into the future. To achieve this, they turned to Ellison Bronze, the company with the longest history of providing marquee entry systems to buildings both new and old. "Ellison doors are a perfect fit for this project," said Rick Michod, Site Representative and Senior Designer with NMDA. "With HL23 located in Chelsea, we at NMDA and the building owners wanted the lobby to resemble a high-end gallery. Ellison provided the aesthetic we desired with a clean look, height, profile and the ability to use a lot of glass." HL23 features a total of five Ellison doors, including one pair at the main lobby entrance with a fine glass bead blasted finish. One pair at a retail entrance and a fifth single service door have a #4 satin finish. Each door is narrow stile, stainless steel, type 304--a perfect match for the contemporary aesthetic of the building. Every side of HL23 was built to catch the eye and capture attention. NMDA designed the building’s east façade by taking a cue from the High Line railway that has been converted into a walking park with greenery. This façade is covered in metal wall panels with an embossed ‘grassy’ texture to reflect the plant life of the park. The north and south facades have striking white beams artfully crossing behind a curtain wall of glass. HL23 comprises 39,200 square feet with eleven homes, a gallery and recreation space in Chelsea. Once an area dedicated to industrial warehouses and car shops, Chelsea is now a popular section of New York City, with its western section considered the center of the New York art world. Located near many shops and art galleries, the steel and glass structure is one of the biggest changes to the area’s landscape since the 1960s. "We're pleased with the look and performance Ellison doors have provided, as well as their notability," said Rick Michod. "In fact, many of my colleagues have recognized the Ellison doors and consequently the project." Much like HL23, Ellison balanced doors are both beautiful and high performing. Their construction and hinging hardware are unique and allow for large, heavy and durable doors to open with ease. For decades they have been known as “The door you can open with one finger.” Traditional swing doors are attached at the frame and the door user must pull the entire weight of the door leaf. A balanced door pivots at two-thirds the width of the door, creating a balance that distributes the weight so the door is easy to open. The inset balancing point allows for an easier opening force, even in strong winds or where significant building stack pressure exists, despite the added weight of the sturdy components. Unlike conventional entry doors, an Ellison formed-up door features a solid sub-frame, which is made of minimum .09-inch thick material. The external door skins are spot welded at close intervals to the internal channel components, yielding an extremely durable unitized construction. Thanks to the quality craftsmanship, Ellison doors are known to have durability and a long lifespan—sure to stand up to New York’s hot summers, cold winters and demanding inhabitants. "The doors fit perfectly with the flow of the exterior," continued Michod. "Based on the success of this project, we would be happy to specify Ellison in the future." HL23 was completed in 2011 and is expected to achieve LEED Gold certification. The project team consisted of architect Neil M. Denari Architects (NMDA), Inc. of Los Angeles, CA; Installer, MacKenzie Door Company, New York, NY; Co-Developers, Alf Naman and Garrett Heher; Interior Designer, Thomas Juul-Hansen LLC, New York, NY.